For a lively, vibrant and fun-filled production, look no further than this ground-breaking pantomime version of Robinson Crusoe! Buckle your swash and set sail with Robinson, Captain Seasalt and Nutty Nick into a world of adventure and hilarity. You’ll meet a host of colourful characters along the way, together with a band of marauding pirates, offering great roles for the Chorus and three principals, Cut-Throat, Cross-Bones and Skull-Duggery. Staging the opening scene in Brazil (unlike Hull, York or Plymouth in most other scripts) has the advantage of introducing tropical scenery, glitzy costumes and Latin music, not to mention our delicious Dame – Señorita Margarita Juicilita! It also offers the bonus of an exciting Mardi Gras Finale! 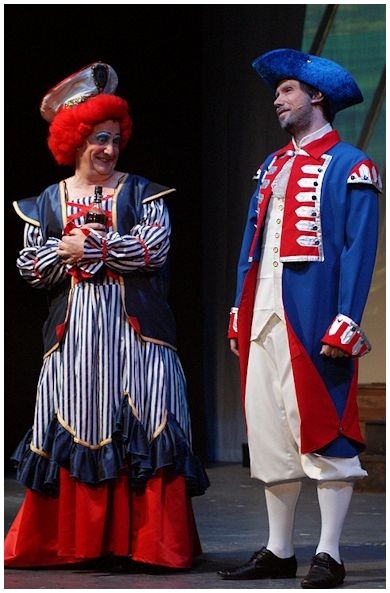 Don't be put off by the old-fashioned nature of other versions – pirates put bums on seats these days – and this is a great choice of pantomime, bound to “float your boat”! Many productions of this script have won NODA and drama federation awards, including Leighton Buzzard Drama Group (NODA “Best Pantomime”)! We also offer a version of this script for schools or youth theatre groups (slightly simplified and with added lines for Chorus members). For a Reading Copy of this, please select Robinson Crusoe & the Pirates and specify “youth version” in the message box on the order form. Yes, I think these two idiots will do nicely. (Calling to them:) It’s Skull‑Duggery and Cross‑Bones, ain’t it? (To Skull-Duggery) I heard you’ve been living in Norway since leaving your last ship. (To Cross-Bones) And I hears you’ve been working in Thailand. No, Toyland! … And before that I was a bouncer at Mothercare! (To Skull-Duggery) What happened to your leg? Did you have an accident on stage? No, I set my heart on playing Long John Silver, so I had my leg off! And did you get the part? No – they were doing Cinderella! And I’m having my arm off next week. I’m planning to sail round the world single-handed! (Pointing out Cut-Throat’s hook) Looks like you’ve beaten him to it! No, someone was a bit careless with a cutlass! A seagull flew over and plopped in it. You can’t lose an eye like that. I did! It was me first day with the ‘ook! If you’ve had an accident at work, you wanna call Claims Direct! … But it might cost you an arm and a leg! … Oh, you two must have already done it! Listen, I am the leader of a treacherous band of dishonest money-grabbers. Not that dishonest! … We’re looking for two new buccaneers. How about it? We’re not working for a bully like you! No, go on – sling yer ‘ook! (He looks at Cut-Throat’s hook.) Oops, sorry! Just a minute – what are you earning at the moment? (Both count up on their fingers as if adding up a large sum.) Nothing! I’ll pay you five times that! (Excitedly) Now you’re talking! We’re gonna be rich! And what ship are we sailing on? Any ship we fancy! We’re pirates, ain’t we? It is possible to avoid one full stage set, playing Act I Scenes 1, 2 and 3 on the set for Act I Scene 3. "…Although the occasional script turns up based on the Daniel Defoe story, Robinson Crusoe tends to be one of the more neglected subjects. But as the author rightly reminds us – in an introduction that is a veritable cornucopia of staging and casting information – it has a strong swashbuckling storyline with all the makings of an exciting and modern production, second to none! Reading his script for the first time is a joy with so much imagination and inventive “theatrical licence” which virtually guarantees, with a fair wind, a smash hit success with children and adults alike. It is all so refreshing and totally lacking in that retro world which can often bog down the more old fashioned pantomimes in a quagmire of tradition, which sometimes needs “geeing up”. It is so inventive – it doesn’t start off in one of the traditional Scene 1 settings of Plymouth, Port of Hull or York but – wait for it – Brazil! This, he points out, has the advantage of introducing more vibrant and exotic scenery, costumes and musical numbers than the bog standard old trad pantomime. And it is more in line with the original classic novel, as it was after settling in Brazil that Robinson set sail on that fateful voyage! He is also quick to point out, early in his introduction, that using this same setting for the finale and walk down gives the director and choreographer the opportunity to create a great Mardi Gras finale. I don’t want to give it all away in a short review. Mr Frayn has written four packed pages of a preface which takes the would-be director through all the steps which give him or her one of the most enjoyable and novel pantomimes in an exciting modern structure, which loses nothing of the underlying great pantomime tradition. It would be a pity not to read it if you are looking for that extra element of a strong exciting story coupled with quite exotic settings and costumes – all of which can be geared to fit the financial parameters or every size of company." "...Alan Frayn's Robinson Crusoe is one of the most exciting pantomime scripts currently available - a new version of the traditional tale with the spectacle and excitement of a South American start and finish. With fun and frolics at every turn, Alan Frayn's formula for success continues. At our first reading, group members were crying with laughter and our audiences simply loved it, hailing the panto as our best yet in 26 years. Great story; great characters; great panto! Keep them coming, Alan!" "...I am a great fan of Alan Frayn panto scripts. They are well written with great humour that appeals to all age groups and have lots to keep an audience engaged. This is one of his less well known scripts but has just enough bizarre elements to provide the belly laughs when required." "...Based on an original script by Alan P Frayn, this production of Robinson Crusoe and the Pirates by the Polegate Drama Group was pantomime at its finest."